A profitable papaya farming business commercially propagates through seeds. As they have numerous health benefits that have been proven and tested by various scientific researches and findings, it’s a popular fruit in many countries. For the farmers of these countries that grow them, the papaya business has been a perennial source of income. When people start buying green products and foods, it even increases revenue. But, because of the lack of proper orientation of what growing papaya entails, people neglect the opportunity of making a business out of papaya farming. Also, some people think about its profits whether it’s small or large one. But, if you’re thinking so then we assure that it’s not a capital intensive business and it yields huge profit than many other businesses. So, you can start the business. Before starting a papaya farming business, you should know about its various benefits. And this is the fruit that comes with a lot of health benefits along with the business benefits for its consumers and producers. Bangladesh is a fertile land and wherever you plan a seed it comes to a tree without any labor or low labor. So, if you’re a jobless individual who is in search of a job then it’s one of the best options for you to start the business. Apart from the business requires a low investment; this is an easy business to produce papayas. Famous for its high nutritive and medicinal values, papaya is a popular fruit. As it comes early in bearing than any other fruit crop, it produces fruits in less than a year and the production of fruits is quite high per unit area. You can cultivate papaya both in the areas of the foothills and plain valleys and in more or less on a commercial scale. Although papaya grows sometimes itself, there are some steps when you think commercially. Well, let’s know what the steps are to start a profitable papaya farming business in Bangladesh. Papaya farming business is an easy type of business that doesn’t take a longer time to start. As your first asset to purchase is obviously the land, which must be good, you should not scrimp on the land. Although the price might be steep, remember that the land is very important for the plant. But, one must remember that these will recuperate for a short time that there are other costs. So, if you’re in a tropical or sub-tropical climate then it’s quite easy to grow them. Because people are beginning to be health conscious, the business is perennially flourishing and is even increasing in profit nowadays. Papaya, which is a delicate plant and anything that disturbs the roots of papayas wouldn’t make it grow well. Planting the seeds directly to where they will grow, no transplanting is the best and most effective practice is papaya farming business. In this case, you can buy the best species of ripped papaya. So, you need a piece of land, clear it and burn the refuge to ashes. After that plant your papaya seed and make a distant of 5 meters from each other. Then, sprinkle on some of your seeds and a couple of dozen per bed is a good amount. Use mulch the patch well than use covering the seeds lightly with more compost. Usually, it takes a couple of weeks to germinate, but it may need longer time. Depending on the environmental factors of the area like light, temperature, rainfall, wind, soil type, etc, water requirement for papaya. As it differs with the age of the plant, a young papaya plant would need more moisture than the older trees. And the reason for this is that the older trees have slower vegetative growth. So, while fruit-bearing trees need irrigation once in every 15 days, the seedlings are irrigated once or twice a week. Although older trees need ample water, they cannot tolerate stagnated water or waterlogging since their roots are shallow and not deep. That’s why it comes with ‘wet feet’ as well as lower fruit yield. 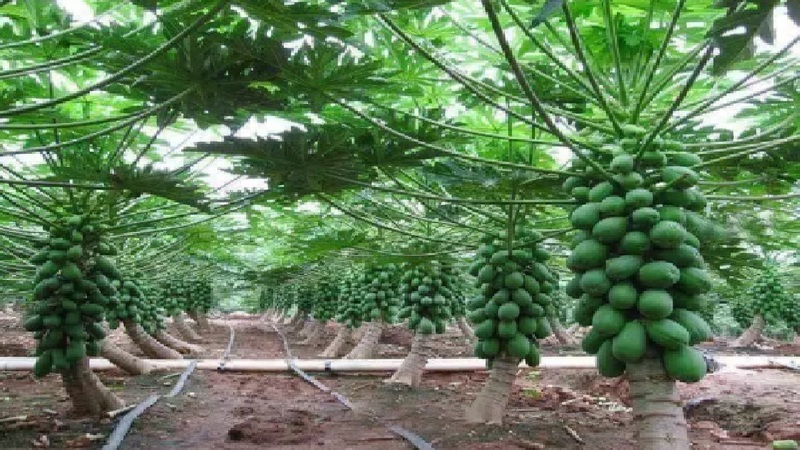 This is because drip irrigation in papaya plantation is a good practice. Although papaya can grow in a variety of soils, a rich, sandy loam is ideal for papaya plantation. If there is found along the deltas and river banks as it can also grow well in alluvial soil. Apart from that, it cannot grow in shallow soils or soils that do not let water drain off easily. Also, it preferred for papaya cultivation a land with a fertile, lime-free and well-drained soil. Papaya crops need a high level of humidity and temperature is a tropical crop. It can cause damage as papayas are sensitive to frost and heavy rains. Also, it can grow in subtropical areas and the areas near the foothills have been found to be the perfect place for papaya farming business in Bangladesh. Moreover, it not only grows well at sea level but up to 600 meters of altitude from sea level as well. But, the fruits decrease in quality when it’s in above 600 meters. Besides, you can plant it during monsoon, autumn, and spring season. But, as the frost can cause damage or injury to the crop, it’s not planted during winter. Since all three cause injury to the plant, the first few things to be considered while planting papaya are rain, frost and hot air.